The sweeping north facing verandah and the light filtering through the trees are a perfect setting for a long evening in a home away from home, with friends on that verandah and bottomless glasses of wine. 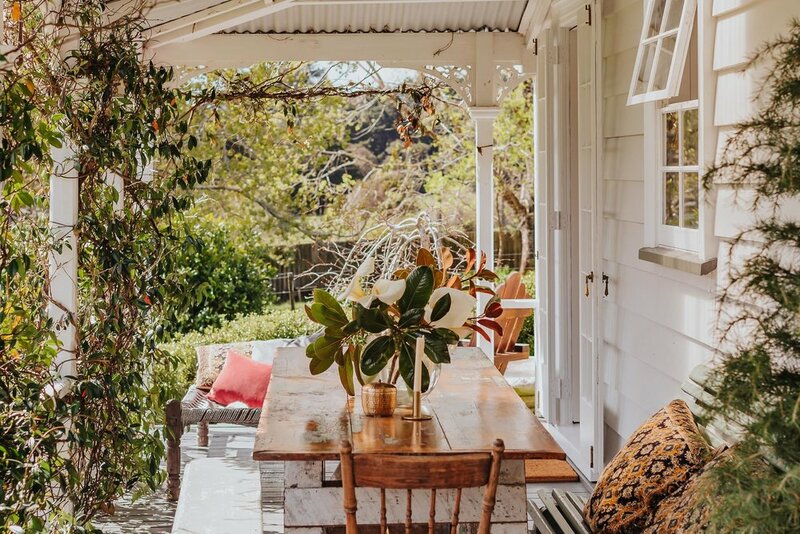 Oozing with eclectic style and romance this beauty was snapped up by Kate and Dave Arbuthnot nearly ten years ago, from Trademe. The wallpaper she chose for one room was produced by Anthropologie, who sent a team of designers to New Zealand for an inspirational recce. The result: a magical bushscape with kangaroos, woodpeckers and badgers! In an effort to simplify their life with three kids, they recently moved from their beloved valley into a 70m2 bach on the water at Snells Beach. It’s a full 180 degree flip. It does however mean that their Totem Retreat, in Whangaripo Valley, is on Air BnB and soon to have its own website. It may seem remote but it is located on one of the most beautiful roads you’ll drive. Along Whangaripo Valley Road and into Pakiri Road, all the way from Wellsford to Pakiri Beach is stunning. Then there are the locals! Every year a group of local girls, including Kate, throw together ‘The Whangaripo Wild Food Festival’. People come from far and wide for the day, with the most incredible wild and foraged food: seafood, rabbit and pukeko stews, swan wontons, snail paella, deep-fried crickets, wild turkey terrine, smoked eel, kawakawa shortbread and nasturtium ice-cream. There are kids roaring around, dogs weaving in and out of legs, beer flowing, tug-o-war and wife carrying contests. “It’s all just word of mouth and it’s wonderful madness,” says Kate.